How’s the Christmas prep going? Have a look at the other Christmas papercraft on Marilyn’s website! Every year, in the final days leading up to Christmas, I decide we need just one more thing for the hampers, and we end up making these spiced nuts. They’re incredibly easy! I made a quadruple batch this time (two kilograms) using egg whites leftover from a recent batch of microwave custard. on December 22, 2011 at 12:09 am Platanos, Mangoes and Me! Norma dear, as they say, “it’s in the mail!”.. ;-) Have a great Christmas! Thanks! Have a great Chrissie! They look great – it looks like there’s lots of goodies to be had in your kitchen this Christmas! I keep meaning to make those toffee bars. Every time I see that picture it reminds me! Those hampers look lovely Celia. Rhubarb and blackberry jam sounds delicious, whack that on a warm scone and ohhhh yum! Brydie, hope you and the Monkeys are having fun this Christmas! The goodies coming out of your kitchen have been amazing! I love the look of the toffee bars. Would they be okay on Christmas day if I made them today. You are so clever and organised, it all looks wonderful. It is a pretty low key Christmas here. We have no children in our family! My son is 38 and won’t be back from New York until 28th Dec. Thanks Debra! I hope you have a relaxing, laid back Christmas! Thanks to your inspiration Celia, I have also opted for Hampers this year too! In mine are my chilli infused olive oil and homemade vanilla essence. I hope everyone loves them! How sweet of you to make up all those gift bags for people. I’ll have to keep those in mind for next year. No time left this year and no energy since we just moved to a new house. 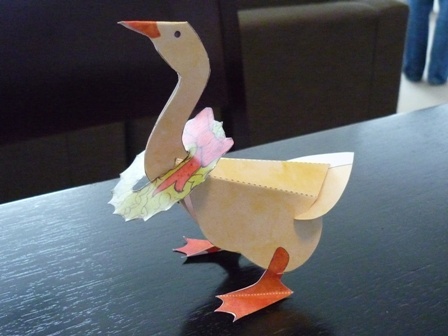 I love crafts, so will definitely check out the paper goose. Too cute!! Those toffee bars are already on my to do list. They look super delicious. Celia, everything is just so festive and lovely. I am envious of your energy (or time). Today is the start my holidays, so I can get down to some more serious preparation. Love reading your pages. Season’s Eatings my friend. I’m a little relieved it’s all done, Lizzy, it’s been hectic! Have a wonderful Christmas and New Year! Amanda, spiced almonds would be delicious – half of my mix this year was raw almonds! Have a great Chrissie! Oh wow Celia they look wonderful. I’m the same, I make hampers for a lot of family members and am always adding extra things at the last minute! Claire, it’s hard to stop, isn’t it? :) I’m always baking right up until the big day! Thanks Yvette! Hope you’re having a wonderful festive season! I went out and bought Christmas cookies this afternoon, albeit from a very nice bakery. (Hangs head in shame) In years past we have done cookie exchanges and returned triumphant with boxes of delish. You have inspired me to get my oven mitts on and get to work. Thanks, awesome you! And zip me an email if you have any ideas for labels for next year, Operators are standing by…. Looks like you are well and truly in the spirit of yuletide. Your packaging looks fab and I can definitely do with some of those spice nuts with my scotch on the rocks! Have a great Christmas with your family. Chopinand, thank you, and Merry Christmas to you and Mysaucepan as well! Celia, you always have the best gift ideas and everything always looks so perfect. It all looks so wonderfully festive and delicious. Lovely hampers Celia. The Christmas pudding truffles sound particularly good. I used cardboard boxes lined with tissue paper for the hampers I’ve already given and am hoping I can find a few more suitable size boxes for the ones I have yet to put together. I made a batch of your nuts earlier on this year for us and they are delicious. This year I’ve made a load of candied nuts in little kilner jars for my hampers – they are so cute I almost want one for myself. Bottles of my chilli sauce amongst other things have also found there way into the boxes or are queuing up waiting to go. Anyway, feeling frazzled with too much to do still, I wanted to wish you, Pete and the boys a wonderful Christmas.